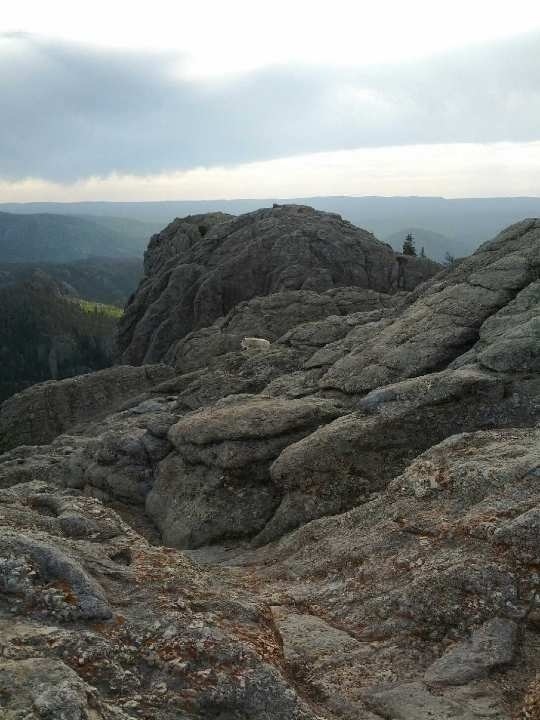 Today we decided to hike up to Harney Peak and climbed to an elevation of 7,242 feet! We trekked over 6.5 miles by the end (Cyrus over about 11–I’ll explain). It was exciting, a rush of energy, a fun sort of a challenge for me being moderate in difficulty—not a piece of cake—but I did my best to keep up with Superman Cyrus. Sometimes he is just an animal when it comes to this sort of activity. I love this about him! Anyway, so speaking of animals I have to explain why Cyrus hiked so much further than I went in distance. 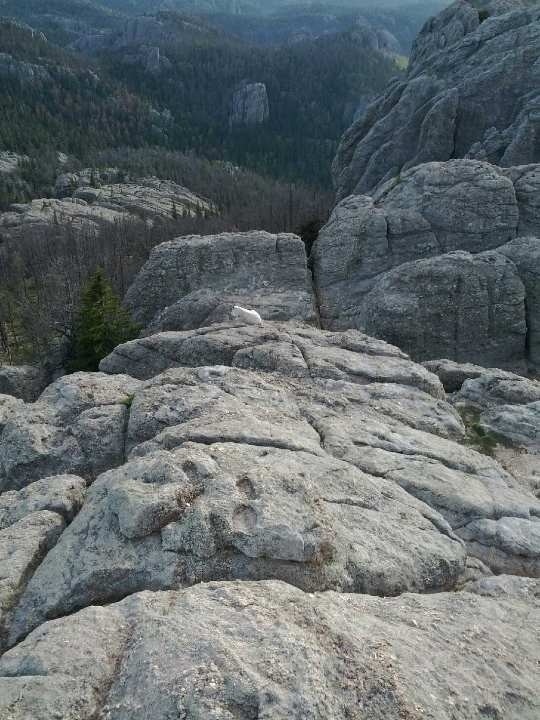 There was this guy with two dogs that left one of his dogs behind on his way up the peak. It didn’t seem to bother him as he had one of the two twin Australian Shepherds right by his side when we reached the peak. The other one apparently didn’t like the stairs at the end of the trail, so he let the dog just lag behind, deaf, blind in one eye, and no collar nor leash–unbelievable. On our way down, little did we know, the dog we encountered on the way up never caught back up with his twin and his human. We ran across the lost dog again this time hanging out with two worried youngsters. This was the point where we were about half way into the 3 mile return and Cyrus blurted out, “Here. Take my bag. I will run back up and find him” and took off leaving me there with Jack (found out the dog’s name after putting the pieces together with the other two dog loving groups that also reached the peak and conversed with the older man lacking one of his dogs) and another sweet young worried couple. It was getting colder by the minute and the sun was fading and still no sight of Cyrus or the man, 30-60 minutes after our separation. Pretty soon we had a party of five including myself waiting with Jack and decided to split up and two of us go up and the rest of the rescue crew take Jack down to see if the man had taken a different trail. Then we finally saw Cyrus but still no old man and dog. Finally, with the temperature dropping quickly and the water supply getting low we had to traverse down. Brrr….it was cold in shorts with a windchill of about 35-40. Anyway, we got to the end and never got to see the man and dogs reunite, but I felt like we were almost heroes and did about everything we could do to help, especially Superman flying back up the steep trail AGAIN. The craziest part of it all was that I felt like I just became a part of the Nora Roberts book I just finished called The Search. It’s all about dogs being a part of a search and rescue team looking for lost hikers. This all made the adventure more exciting! After we notified the park ranger of the situation we celebrated our climb with a toast of wine barely catching the end of sunset and drove home to Blue Bell Lodge ravenous and ready for our late Fajita Taco Salad for dinner. Had a pet chipmunk when I wadin grade school. Nice pic show! He is so sweet! Animals are so much like people! We need spec. Olympics for animals! Country! Be careful and hv fun!